Many Kiwi anglers will remember with fondness the old Fenwick Feralite fiberglass fly rods that were manufactured and marketed by Kilwell Sports back in the early seventies. In their day these were top quality fly rods. A new Fenwick Feralite back in 1972 would set you back the princely sum of $45.00. This compares with $31.00 for a similar sized 9 weight fibreglass Customline model that was also put out by Kilwell at the time. The Feralites, there were two models, were very light weight for their day. They also incorporated the new Fenwick patented fiberglass ferrule: Hence the name Feralite. Fenwick’s new patent was the first granted in the United States covering actual fishing rod construction in fifteen years. It was a radical departure from the previous brass ferrules. This meant that rods could be lighter and the new fibreglass ferrule was the closest thing to a single section rod. The two models made were the FF 116 two piece at 9’4″. It weighed five and three quarter ounces and its action was described as powerful. The other model is the FF 98, again a two piece measuring nine feet. Its weight is a very light at four and three quarter ounces. The action was described by Kilwell as medium powerful. Each rod came complete with cloth bag and carrying tube. I purchased my 9 weight FF 98 second hand. Back in 1972 I was still at school and certainly wouldn’t have been able to afford $45.00. Unfortunately the original tube and cloth bag were long since lost by its former owner. The Fenwick Feralite is still, even by today’s standards, a very good fly rod. It is very light and has a feel that most modern rods are lacking. 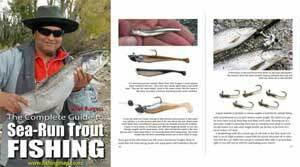 I use mine as a lure rod for trout fishing in the normally discoloured water of the nearby Waimakariri River . I wouldn’t trade mine for anything. You can still find them second hand, though they are now much harder to get than they were a couple of years ago. A second hand one in reasonable order normally fetches between $100.00. and $200.00 depending on condition. Occasionally I have seen the odd one, though not for sale, that has been in pristine condition. It was as if they had never been used. To see one in this sort of condition is a real joy to me. It must work against Kilwell’s sales to some extent, if a rod purchased from them 34 years ago is still working perfectly today. Still catching fish after all these years!